Watching the dogs might be a little boring? Here is a typical morning in an urban park where there are coyotes and where dogs run free. 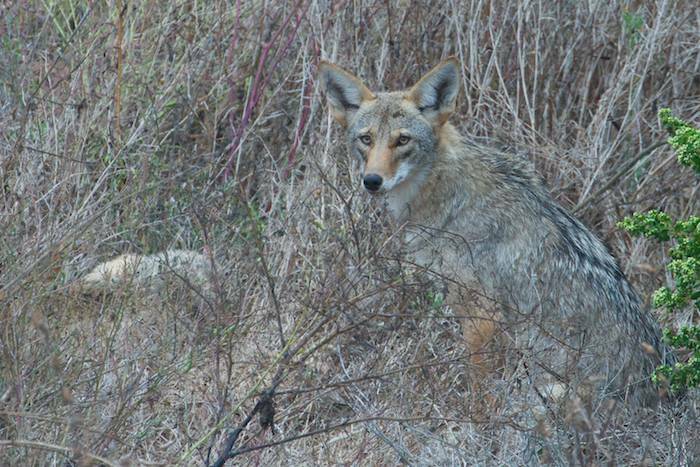 If you have a dog and know coyotes are out, or if you see a coyote, you need to leash up and move on. In this park, there is a particular team of dogs which chases and harasses these coyotes on an almost daily basis. On this day, coyotes were out finishing their nighttime trekking. They picked one of their favorite knolls to hang out on. They often stay out to watch and keep an eye on the dogs which visit the park daily, but also they are there “to be seen” by these same dogs: they want these dogs to know that the territory is already claimed — their presence sends this message. It is a purposeful activity. They knew the route and the time that most dogs would walk by, and that time was coming up. They plopped themselves down high up on the incline a substantial distance from any trails and began grooming themselves. Most dogs and their owners passed uneventfully, as usual: most folks in San Francisco are in awe of and love their urban coyotes in the parks: It makes the parks seem a little more “natural”, a little closer to the nature that humankind once knew, a little further removed from the city right next door. 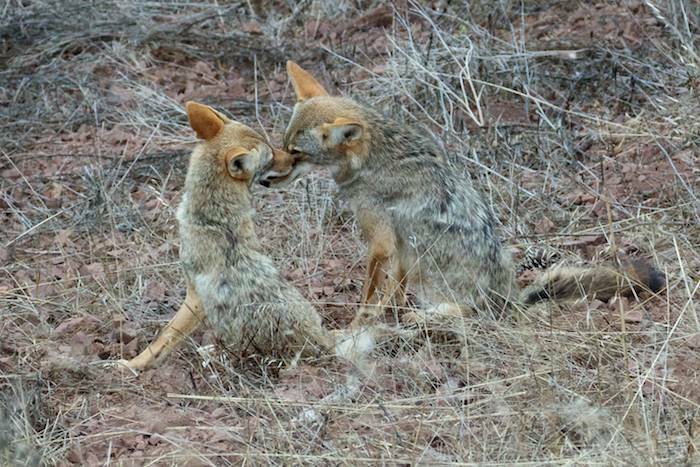 Both coyotes and dogs learn something about each other as they watch one another, and peace is maintained by the owners keeping their dogs away from them. 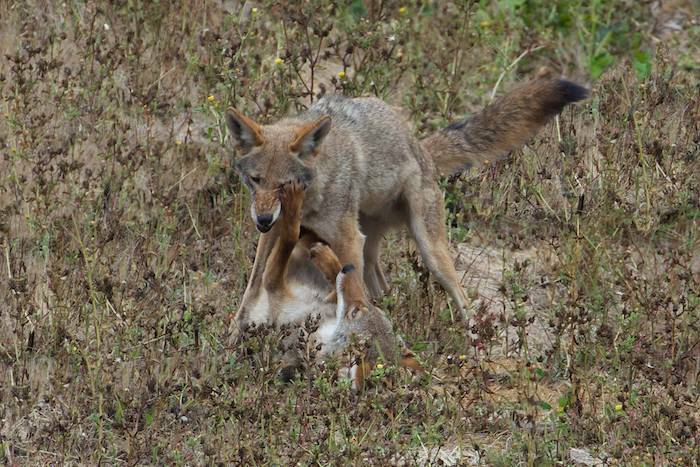 Unfortunately, there are antagonistic dogs who pursue, and owners who allow their dogs to pursue and harass coyotes. It is always the same dogs, and it is always the same owners who allow it, and it happens on a regular basis. It happened again today, as predictably as the dawn itself. Two dogs from the same family — therefore a “pack” working as a team together — came up the trail ahead of their owners and went searching for the coyotes, saw them and chased after them. The coyotes ran further up the steep incline which was difficult for the dogs. The coyotes stayed up high on the hill and watched. At one point, when the second dog appeared they came down a little, still keeping their safe distance away. One of the dog owners, one who had no intention of ever leashing his dogs to control them, ran up the hill towards the coyotes and starting heaving rocks at them, snarling, “Darn coyotes, stop bothering my dogs! 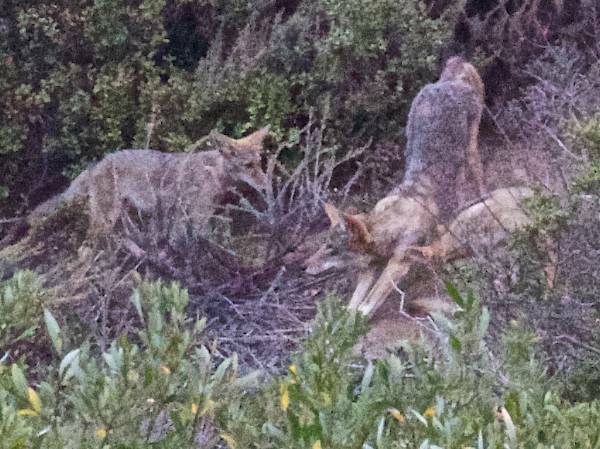 !” The coyotes backed up a little preparing to flee, but the dog owner backed down the hill. Of course, it was the dogs and owner who were doing the harassing, not the other way around. Eventually the recalcitrant dogs and disrespectful owners walked on. 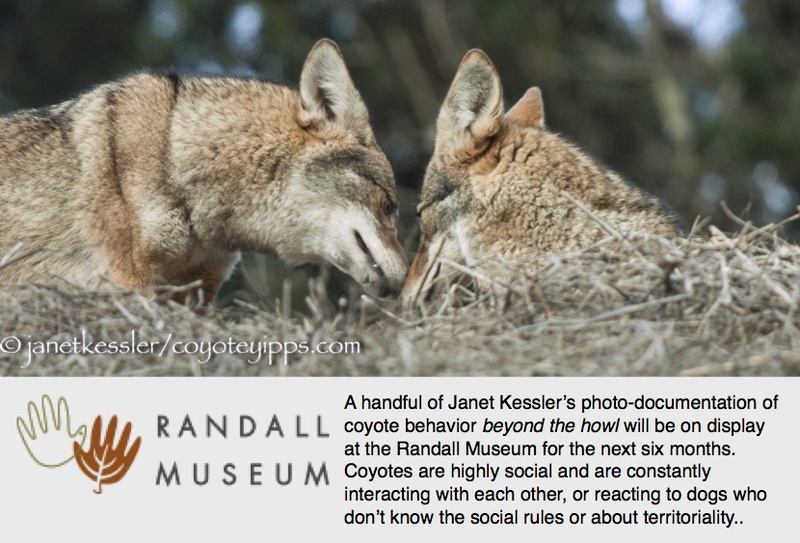 The coyotes watched them leave and then hung around to watch and just “be” for a short time, grooming themselves and probably communicating in ways we humans cannot understand: their distress, relief, joy, excitement, and fears, among other things, are communicated simply by the way they act — by their body language and facial expressions. Then it was time to go. 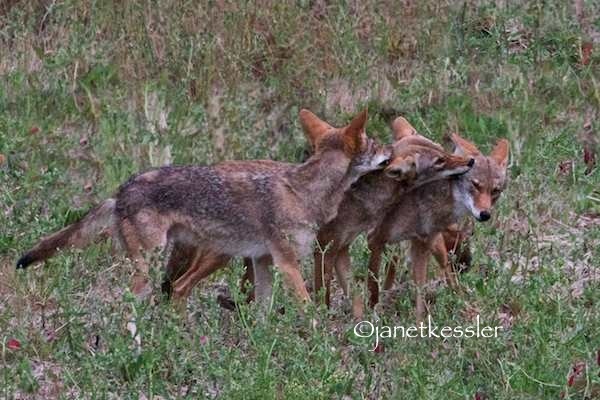 The coyotes ran towards each other, tails wagging, bodies bouncing and wiggling, and headed off. They were all intact, there were no injuries, the territory was still theirs. They seemed to celebrate all this as they left the area hugging next to each other as they went. He stands in front of her waiting for the routine grooming and tick removal which has become an everyday occurrence between these two. But she is busy grooming herself this time. He stands patiently, but she does not respond — she continues grooming herself. Finally, he lets her know more forcefully by engaging her muzzle — “can’t you see what I want?” Whether she sees it or not, she does not respond. He then plops himself right in front of her — maybe this might get a response? But no, she concentrates on her own grooming. Finally she heads off. He watches, a bit defeated, and then follows her. I’ve seen this “request” a number of times now in several coyote pairs. More often than not, one ends up grooming the next one. Maybe it involves a request to relieve a particularly bad skin itch or pain. I always wonder why the service is not a mutual one.